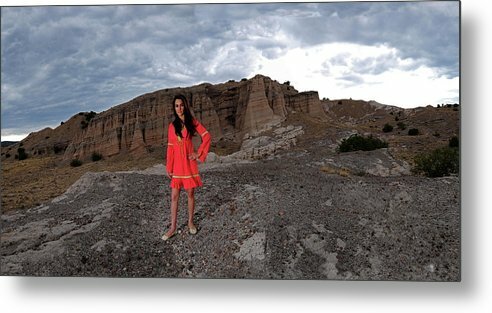 New Mexico Princess by Dale Davis - 12.000" x 6.250"
New Mexico Princess metal print by Dale Davis. Bring your artwork to life with the stylish lines and added depth of a metal print. Your image gets printed directly onto a sheet of 1/16" thick aluminum. The aluminum sheet is offset from the wall by a 3/4" thick wooden frame which is attached to the back. The high gloss of the aluminum sheet complements the rich colors of any image to produce stunning results. There are no comments for New Mexico Princess. Click here to post the first comment. 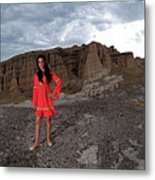 This is a panorama with model taken in mountains of Northern New Mexico with approaching monsoon weather. THIS PANORAMA PHOTOGRAPHY CAN BE DRAMATICALLY PRINTED ON 8 FEET IN WIDTH ON CANVASS. Dale Davis is a real estate developer in Texas who enjoys the artistry of photography. Having a love for photography since taking his first black and white photography course as a teenager, he has been on a pursuit for better and more interesting pictures of places and landscapes.